At one point, you’ll need to install, remove or transport your vehicle’s transmission. Transmissions are quite bulky with most of them weighing anywhere from 100 pounds to over a ton. That said, you need a tool that will make the process much safer to reduce the risk of injury as much as possible. 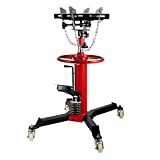 The heavy duty transmission jacks are the best option for such tasks. This is a tool that handles your transmission’s weight and come with mechanisms that maximize motion and control during the process. Transmission jacks aren’t made the same nor are they designed to do the same job. Therefore it makes sense to consider several things that will fit your need when searching for the best transmission jacks. Some considerations to keep in mind include weight capacity, range of motion, structural strength and stability. Other extras would include price and warranty. Furthermore, you’ll need to consider the type of transmission jack you want, whether a low-profile one or the high-lift jack. We’ve done some research to give a recommendation of the best transmission jacks outlined below. 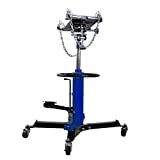 This is a high lift pedestal jack designed for vehicles with large clearance or those that are on a lift. It operates via a hydraulic foot pump that raises it from 34 inches to 70 inches. Such a wide lift range is made possible by a 2-stage telescopic ram. The lift capacity is 1100 pounds. Easy movement and improved stability is provided by swivel casters and a wide 4-leg base. The jack fits most transmissions and is made of heavy duty steel for maximum durability. This jack packs a great punch in its small size. 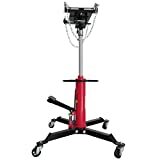 It comes in a high lift pedestal style operated using a foot pump. The saddle is fully adjustable and comes with safety chains to secure transmissions. It lifts from 33 to 70 inches and supports transmissions weighing up to 1500 pounds. The base comes wide for added stability and is fitted with four 360 degree swivel casters to provide an all-direction movement. The jack is ideal for automotive and light truck transmission installation. 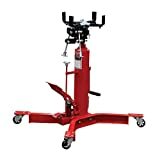 This high lift jack makes transmission installation and removal quite a breeze. The jack comes tough in a solid steel construction that offers a durability you can depend on. The saddle is fully adjustable and comes with chains that function to secure transmissions. This transmission jack provides a lift range of 34 to 70 inches and supports transmissions up to 1100 pounds. It sits on heavy duty casters and a wide base designed for increased stability and easy movement. Looking for more clearance? Well, this high lift transmission jack might just be what you’re looking for. It sports a pedestal styling activated via a foot pump for hands-free raising. The jack extends from 35.5 inches to an impressive height of 74 inches. 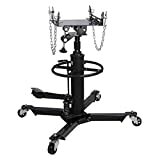 It comes in a heavy steel construction to provide a sturdy support capable of handling transmissions up to 1000 pounds. Chain tie downs come in handy to secure the transmission to the base of the saddle. 360 degree swivel tread wheels provide stability and smooth movement in any direction. This pedestal jack is designed to be used with above-ground and in-ground lifts. It sports a durable steel construction with a dipped enamel finish for extra protection from elements. The saddle can be adjusted to fit any type of transmission and comes with chains to secure it down. The lift range is 49.6 to 68.7 inches supporting a load capacity of 1000 pounds. A wide base and large 3-inch casters are included to keep the jack stable and let it move in virtually any direction. Vehicles with less clearance will do well with this low profile jack. This is a jack that’s been 100-percent tested to conform to the required safety standards. It comes with a reinforced base and wide stand fr maximum stability. The jack lifts from 8.66 to 22.64 inches and has a load capacity of 1000 pounds. The base sits on swivel casters fitted with ball bearings to provide smooth and quiet movement. There’s a safety overload protection system that comes in handy whenever the load capacity is exceeded. This high rise jack provides the convenience of a 2-stage lift designed to offer a greater lift range. The first stage is designed for speedy lift and makes use of a fully air-operated mechanism. The second stage operates on a precise hydraulic lift that provides better control. The lift range is from 34.5 inches to 72 inches. The maximum load supported is 1000 pounds and straps are included to secure the transmission in place. There are 4-inch swivel casters to provide ease of movement and extra stability. Install and remove any type of transmission using this universal jack. It has a saddle that tilts in any direction to provide an adjustable and secure fit. The jack is made of heavy duty steel and finished in chrome to prevent rust and corrosion while adding that stylish look to it. Raising and lowering is achieved via a foot pump that provides a lift range of 35 to 71-5/8 inches. 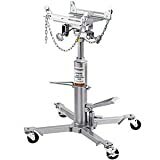 The jack is used for transmissions up to 1000 pounds and has a wide base and rugged swivel casters for stability and ease of movement. This jack comes in handy to take care of high position installations. It’s of a high lift design operated via a foot pedal. You get a lift range of 34 to 70 inches and there’s a double spring mechanism that automatically halts the lowering action for safety and precise control. Chains are attached on the saddle to secure the load in place. 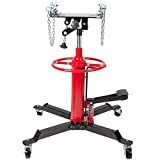 This transmission jack comes with easy-rolling swivel casters for easy mobility and has a load capacity of 1100 pounds. This is a high quality transmission jack that makes the guiding and installation process a whole lot safer. The jack comes durable in a powder-coated steel construction designed for strength and maximum protection from rust, scratches and corrosion. It has an extra long chain that locks the load in position. The jack provides a lift range of 33 to 70 inches and supports up to 1100 pounds. The lowering cation halts automatically via a spring loaded release valve. 360 degree casters are included for easy maneuverability.